Oliver (Stephen Amell) walks into the ARGUS prison to free Slade Wilson (Manu Bennett) for his help in rescuing Team Arrow. Slade: “You and me kid, like old times.” The prison guard walks in, Oliver tells him he is taking Slade and that the guard should get on a boat and leave the island. The guard tells him he won’t leave his post, so Oliver knocks him out. Slade tells Oliver the mirakuru left his system a long time ago and he is sane now. 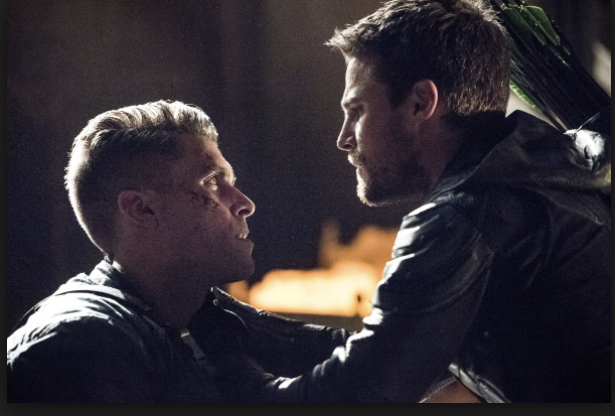 Slade wonders why Oliver would free him, since he killed his mother. Oliver explains his situation and he needs Slade’s help. He gives Slade his old Deathstroke mask. Nyssa (Katrina Law) and Malcolm (John Barrowman) are on the beach arguing about her disbanding the League of Assassins and his hand. Malcolm: “Are you looking for applause? Clapping is a little difficult for me these days.” Oliver walks up to them with Slade and Digger Harkness [Captain Boomerang] (Nick E. Tarabay). Boomerang acts like a sleaze and eyes up Nyssa. She threatens to feed his eyes to him if he continues. Malcolm: “You’re not her type anyway.” Before they can get the rest of the supplies off their plane, a RPG destroys it. Slade wonders how they are going to get off the island. The group splits up. Oliver, Slade, and Boomerang leave together. Malcolm: “I’ll check the RPG site.” Nyssa: “I’ll accompany you.” Malcolm: “It’s almost like you don’t trust me, Nyssa.” Nyssa: “That’s exactly while I’ll accompany you.” Boomerang asks Oliver for a weapon just like Slade. Oliver: “I trust him more than you.” Harkness: “Didn’t he kill your mother?” They come upon some unguarded cages that hold Felicity (Emily Bett Rickards), William’s mom Samantha (Anna Hopkins), Thea (Willa Holland), and Curtis (Echo Kellum). Thea asks what Slade is doing there. It is obviously a trap and Talia (Lexa Doig) and Evelyn (Madison McLaughlin) drop out of the trees into the clearing. Boomerang also has a gun, he had already made a deal with Chase, so he’s not only a sleaze, but also a double-crossing, backstabbing SOB. He asks Slade to join the winning side. Slade appears to switch sides and tells Evelyn to put her gun close to Oliver’s head. Slade hits Boomerang and Oliver flips Evelyn onto her back. Talia tries to shoot Samantha with an arrow but Oliver uses a knife to stop it in its path. Malcolm and Nyssa join them and Nyssa screams, “Sister.” Talia uses a smoke bomb to help her and Boomerang escape. Oliver asks Evelyn where they are keeping the rest of his team. Evelyn sasses back at him in her cage. Slade to Evelyn: “You’ve been left behind. You should choose your friends more wisely.” Oliver asks them if they remember where the plane they came on is. They think they do. He asks Malcolm to fly them to safety and come back for the rest of them. Thea doesn’t want to leave; she is concerned about Oliver working with Slade and Malcolm. Thea: “We are orphans because of those two.” He calls Thea ‘Speedy’ and asks her to go so she can look after Felicity and Samantha. She agrees too. 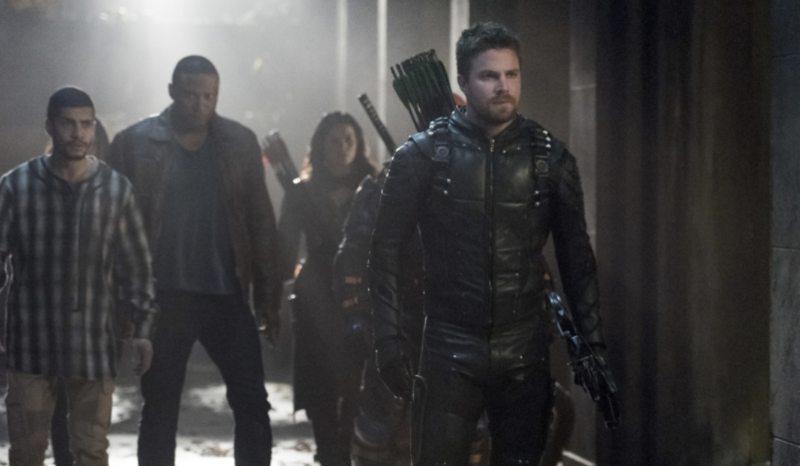 In the island’s temple, Black Siren (Katie Cassidy) escorts Diggle (David Ramsey) and Lance (Paul Blackthorne) to the chained up Dinah (Juliana Harkavy) and Rene (Rick Gonzalez). Lance: “Nice place. Does Lian Yu have a Big Belly Burger, too?” She smirks and leaves the prisoners alone. Dinah can’t use her canary scream because they have a dampener above her. Diggle wonders what Oliver will be able to do when he tries to rescue them. Lance doesn’t think that Oliver even knows where they are. Before they separated, Oliver and Felicity kissed. Samantha wants to discuss the two of them. Felicity: “Could we save the horribly awkward conversation for when we’re off this island?” She confides to Felicity that she isn’t going to leave the island without her son. Thea and Malcolm’s conversation isn’t as friendly. Malcolm: “You okay?” Thea: “Go to hell.” Malcolm: “I’ll take that as a yes.” Before Thea can really tell him off, she steps on a landmine. Malcolm suggests taking her place on the mine. Curtis: “Look, I’ll just find a boulder around here or something.” Thea tells him not to, but Malcolm quickly shoves Thea off the landmine and puts his foot on it before it explodes. Thea tells him she never asked him to do this. Malcolm: “From the moment you were born, all I ever wanted was to protect you, you may not think of me as your father, Thea, but you’ll always be my daughter.” Boomerang and some of Chase’s men show up. Malcolm sends them away. Boomerang wonders why Malcolm is just standing there. Malcolm: “Let me show you.” Thea hears the explosion. Oliver and Slade see the plane that was a major plot point in season two. Before they can reminisce, Nyssa points to the temple. Once in the temple they split up again, Nyssa is by herself. Slade says Nyssa doesn’t trust him, Oliver asks can he blame her. Slade knocks Oliver out. Black Siren walks in and Slade tells her he has a present for Mr. Chase. Oliver reunites with the rest of his team. Diggle is surprised to see Slade. Oliver tells him he shouldn’t have trusted him. He asks if they have seen William, they have not. Oliver tells them they have to find him. He gives Dinah the dampener-defeating device Curtis had built for her. She puts on the device and breaks their chains using her canary scream. Talia hears the scream and heads towards them. Nyssa runs into Talia and her students. Talia is upset that Nyssa is helping Oliver, the man who killed their father. Talia: “He’d be ashamed of you.” Nyssa: “Father was always ashamed of me.” Nyssa is still upset that Talia left home, leaving her with their father. Talia knew their father would never let her take over the League of Assassins, but he took her leaving out on Nyssa. Instead of going to therapy together, the sisters fight. When the students try to get involved, Slade joins the fight on the side of Nyssa. His betrayal was a trick, and she and Oliver knew it. After she defeats Talia, she tells Nyssa to kill her; Nyssa only knocks her out. Thea and Felicity discuss Malcolm’s sacrifice and Thea’s mixed feeling towards him. Felicity can relate, “I have some experience with evil dads, too.” Even though Malcolm was evil, he showed Thea through saving her that he loved her. Curtis interrupts them, “‘Ze plane, boss, Ze plane!’… What, too dated?” He has found the plane they came on. The plane was disabled and they find explosives around it and with their pad, they detect explosives all over the island. All of the commotions in the temple brings out Adrian Chase (Josh Segarra). Oliver screams at him where William is. Chase won’t tell Oliver unless he is willing to kill him. Oliver won’t kill him so the big fight begins. Konstantin Kovar (Dolph Lundgren) heard the gun and he is disappointed Oliver killed himself this quickly. But he and his goons come upon an empty cell. Kovar tells his goons to leave killing Oliver to him. Oliver runs to the box that has his supplies, he checks his watch to see how much time he has before the rescue boat arrives. Three of Kovar’s goons with machine guns confront Oliver. He easily takes out the three gunman and takes out three more. One of Kovar’s lieutenants says it is impossible Oliver is doing this. Kovar says not with Oliver. He is going to get something that will take him out. Oliver uses a log trick to take out one goon, and breaks the other goon’s back. A helicopter appears and tries to shoot Oliver. Oliver shoots down the helicopter. Kovar is the pilot. Oliver prepares to shoot him, but his machine gun is out of ammo. Kovar: “I don’t have to kill you, just make sure you don’t get on that boat.” They fight, and their fight blends in with the present day fight on Lian Yu. In the present, Black Siren and Black Canary both do their sonic screams. They knock each other backwards. Black Siren gets up first and heads toward Dinah, “You thought you could replace me? That’s cute.” Lance knocks her out from behind. He truly understands this is not his daughter. Back in the past, Oliver breaks Kovar’s neck. He has very little time left to signal the rescue boat. In the present, Team Arrow and Oliver defeat Chase and his army. Chase keeps trying to get Oliver to kill him. He keeps reminding him of his past. Oliver: “That’s who I was before. That’s not who I am now.” Oliver is though feeling guilty about what he has done, including killing Chase’s father, and his father’s suicide. Oliver: “I’m done blaming myself for mine.” Chase makes one more desperate attempt to get Oliver to kill him; he tells Oliver he killed William. Oliver doesn’t believe him. He emphasizes to Chase, “I am never going to be the person you want me to be. Not ever.” Chase does the smoke bomb trick and escapes. Oliver tells Diggle to get everyone to the plane. He is going to look for his son and keep Chase from escaping. Oliver runs through the island the same way he did five years ago when he was trying to make sure he didn’t miss his boat. Back in the past, Oliver stops to put on the disguise that would make the fishermen believe he had been a castaway on the island the entire five years. Oliver spots the boat and shoots a flaming arrow in the bonfire pile. The ship spots his fire. On the fishing boat, Oliver calls his mother Moira Queen (Susanna Thompson). They have a touching conversation. He tells her he is coming home. In the present, Oliver catches up with Chase on his escape boat. William (Jack Moore) is in the cabin. Chase gasps out, “For an absentee father, your devotion is impressive.” Felicity calls Oliver, she tells him about the explosives and that a dead man switch controls it. Chase tells Oliver that he can kill Chase and save his son, but everyone else dies, or not kill him and watch him kill William. Oliver shoots him in the leg with an arrow and grabs William. Chase shoots himself in the head and the explosives set the island aflame. Instead of going to therapy like most wealthy people, Oliver has spent the past five seasons working on his issues using a radical therapy technique, fighting crime and killing a whole lot of people in the process. By the end of this episode, thanks to noted therapist Deathstroke, Oliver is able to forgive himself and move forward. It might help you move on if the place that began your trauma blows up in front of you. Of course losing all your friends might set you back again. Oliver has been on a ten-year journey, beginning when his boat sank to watching Lian Yu burn. Oliver went through hell in Lian Yu, Hong Kong, and Russia before he came back home. His last five years in Star City haven’t been a walk in the park either. Oliver blamed himself for everything that happened and tried to shoulder the burdens all by himself. Diggle, Felicity, Thea, and the rest of Team Arrow eventually showed him he isn’t alone, that other people have big shoulders too, and can carry part of the burden. This season, the lessons he has been learning began to take root. The old Oliver wouldn’t have hesitated to kill Chase. Chase gave him every reason to do it, but like he told him, “That’s who I was before. That’s not who I am now.” Letting his past go will allow him to move on. I’m going to take a wild guess, and say that the rest of the cast of Arrow didn’t just die on Lian Yu. The show isn’t going to be renamed “Arrow & Son”. Once they are reunited with Oliver, I can’t wait to see what directions the show will go in. Having all the guest stars from previous seasons appear on the show, especially Manu Bennett was great. It was a great way of wrapping up the first five seasons of the show. The fight scenes were fantastic, my favorite being the fight between the al Ghul sisters. I would like to see them mix it up again in future seasons. If this was actually John Barrowman’s final episode in the Arrowverse, he will be missed. He was always a fun frenemy to Oliver and Team Arrow. At the end of season four of Arrow, I was close to giving up on the show. It had drifted away from being the dark crime drama it was its first two seasons, to being this broody CW show that didn’t know what it was. Having Oliver fight a villain who used magic, and having a nuclear bomb blow up an American city was too ridiculous. They were going through what the Flash is going through now. The producers and writers were smart enough to go back to the basics and bring the show back to its roots, and still allow the characters, especially Oliver grow. A nice comeback season.